Dental caries is also known as tooth decay. The main source of tooth decay is dental plaque. A plaque is a sticky white or yellowish film that always attaches to our tooth surface when food is consumed. One of the most important factors related to cavities is the consumption of carbohydrates or sugar. In children who still drink from the bottle, one of the most important causes of caries is putting them to bed with a bottle. Both juice and milk contain sugar, which remains on the babies teeth overnight resulting in the formation of "Nursing Bottle Caries", usually in the upper teeth. 1. Teach the child to brush when the child is old enough to hold a toothbrush properly, usually at 2 years of age. 2. Do not feed sweetened juices or liquids while the child is going to sleep. The liquids will trap underneath the child's upper lip causing their upper front teeth to decay. 3. Start cleaning the child's tooth usually at 6 months of age (approx start of tooth growth). Just wipe the tooth all round with a clean cloth or gauze. 4. Visit a dentist every year. Make it a routine so that the child has no fear going to a dentist. 5. Review proper tooth-brushing techniques with the dentist. Plaque formation can be avoided by brushing everyday and flossing regularly. 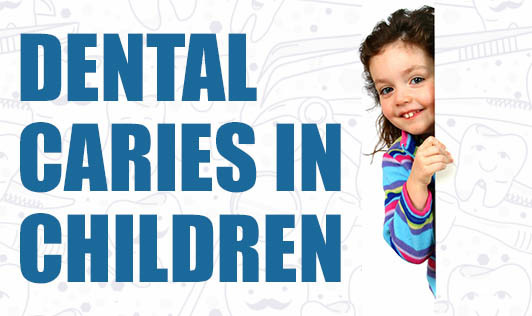 It is important to start healthy oral hygiene habits when the children are still young. These habits will enable them to have good teeth and great smiles for a life time.